Written and directed by Sudha Kongara Prasad, Irudhi Suttru, a bilingual sports drama film released today i.e on 29th January 2016. 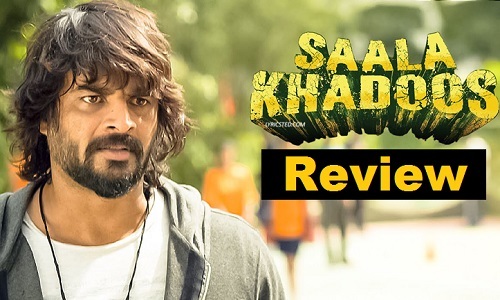 The movie simultaneously released in Hindi by the name “Saala Khadoos”. The film features R. Madhavan in the leading role as boxing coach, with newcomer Ritika Singh as an aspiring boxer. Check out Irudhi Suttru (Saala Khadoos) Movie Review, Rating, Story, Live Updates, Public Talk from here! Madhavan ‘khadoos’ (boorish) boxing coach, had a dream to win the boxing gold for India is banished from the national institute and not allowed to participate in the game, he moves to another city, where he finds Ritika Singh, a poor 17-year-old girl who has the passion and skills of a boxer that Madhavan had been looking for. The film traces the coach’s journey as he prepares the young girl to create a place for herself in the world of boxing. #IrudhiSuttru 1st Half : Moves like a sharp bullet.. No wastage on any scene/dialogue.. @ActorMadhavan , Rithika and Santhosh BGM Mersal.. The movie will revolve around the boxing with a Khadoos coach and talented but arrogant student. One can expect the lot of thrills, action and sportsman spirit in this boxing drama with Madhavan and Ritika. The film shows the potential of a novel, gripping affair. Madhavan’s intensity of emotions, Ritika’s raw talent is plus points. Mumtaz Sorcar, Nassar, Zakir Hussain and other supporting artistes’ performances are also big assets of the film. As a boxing coach, actor R Madhavan has delivered brilliant performance and his intensity of emotions is the main highlight of the film. Final Verdict: A must watch for lovers of good cinema which engages and entertains through out.